SAN MATEO (December 19, 2013) – Duck Duck Moose, creator of educational mobile apps for children, has launched Build A Truck, the third app in their award-winning Trucks series with Trucks and More Trucks. Both original top-selling apps have received Parents’ Choice and Children’s Technology Editors’ Choice awards. Build A Truck allows users to design their own monster trucks and then race them through different terrains. Users can experiment with different truck parts and watch the physics play out, through speed, torque, drag, mass, inertia, friction, acceleration, and gravity. – FACTORY: Choose a body, paint, decal, wheels, engine, and exhaust! Add dragon wings, sirens, propeller hat, and more. – GARAGE: Start collecting cars and earning medals in the Garage. – RACE: Race your truck through snow, jungles, sewers and an ever changing surprise track for unlimited play. Build A Truck is now available in the App Store for $1.99 USD (or equivalent amount in other currencies) and available worldwide exclusively through the App Store in the Games Category. Duck Duck Moose, an award-winning creator of educational mobile apps for children, was founded in 2008 by three parents who share a passion for children, education, music, design and play. Following the launch of its first app, Wheels on the Bus, Duck Duck Moose quickly became a leader in the industry by creating fun, engaging and educational apps that are loved by children and trusted by parents. To date, the company has created twenty one top-selling titles and has received 16 Parents’ Choice Awards, 17 Children’s Technology Review Editor’s Choice Awards and a KAPi Award for the “Best Children’s App” at the 2010 International Consumer Electronics Show. 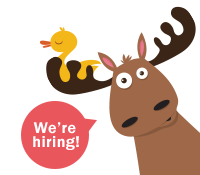 Duck Duck Moose is headquartered in San Mateo, California.